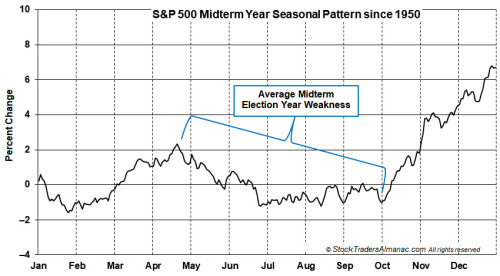 Anyone familiar with the annual Stock Trader’s Almanac and this blog is most likely familiar with the above chart depicting the seasonal pattern of S&P 500 in midterm election years since 1950. Midterm years, like 2018, have a poor reputation largely due to their weak performance. However, we like to refer to midterm as the “Bottom Pickers Paradise” (page 30 of STA 2018) due to the buying opportunities this weakness offers. Over the last 17 midterm years, S&P 500 has declined an average 16.90% sometime during the year. The biggest decline was 37.6% in 1974 and the smallest was 4.36% in 1958. Once the decline ended, S&P 500 was higher 1-, 3-, 6- and 12-months later 100% of the time. The average gain from the end of the midterm year decline to one year later was 32.29%. 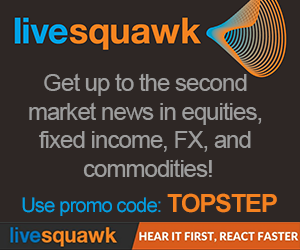 Was February 8 the end of this midterm year’s decline? Based solely upon historical data, it could be. S&P 500 declined 10.16% in 13 calendar days this year already. Although below historical averages it is not that far from magnitude and/or duration of declines in 1954, 1958, 1986, 2006 and 2014. For this scenario to become reality, S&P 500 would need to close at a new all-time high and not decline greater than 10.16% for the remainder of the year. NASDAQ’s new highs earlier this week and last have proven fleeting. Another (and increasingly more likely) scenario for S&P 500 in 2018 would be to rally up to and stall just below its January closing highs before retreating to test and possible violate its February lows sometime during the Worst Six Months (May to October) which would then create the perennial midterm buying opportunity.